How did Arsenal’s deadline day transfers perform this season? The summer of 2011 saw more significant departures than arrivals at Arsenal, namely in the transfers of Cesc Fabregas to Barcelona, and Samir Nasri and Gael Clichy to Manchester City. By the final day of the transfer window the club had only strengthened modestly, bringing in Gervinho early on followed by the inexperienced Carl Jenkinson on a free transfer, and the young talent Alex Oxlade-Chamberlain from Southampton at the beginning of August. Cue the 8-2 collapse at Old Trafford on 28th August, when a stretched squad and inexperienced team crumbled on the pitch after a difficult midweek Champions League qualifier at Udinese. Arsenal had managed to regain entry to the Champions League, but their league form was disastrous, finishing in the top four an unlikely hope. Wenger and the club had to take action as the team entered some of the darkest days of his 16 year reign. Fans were calling for change, and Arsenal, not known for excessive transfer activity, went into overdrive. This is an excerpt from my latest article, continue reading the full piece here. The name of Alberto Méndez is one familiar to aficionados of Premier League stars who never were, that of a Wenger signing who never quite made the grade at Arsenal. In 1997 he was ‘the craziest football story of the summer’, but joined the small list of players including the likes of Stefan Malz and Tomas Danilevicus who came from nowhere but never fulfilled the potential Wenger saw in them. For every Patrick Vieira or Thierry Henry there are hundreds of these, young men plucked from obscurity, very much a hallmark of Wenger’s successful transfer policies. 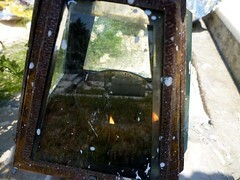 However, Alberto has a story of his own to tell. Andrey Arshavin may not know it, but this previous incumbent of the number 23 shirt also went on to become a skillful midfielder. Like Arshavin, this season has been a tumultuous one for the German of Spanish descent. Having discussed the tactical possibilities available to Arsene Wenger with new signing Marouane Chamakh, it seems appropriate to follow up with a more detailed study of the way Chamakh actually plays, based on matches he played for Bordeaux in 2009-10. Under Laurent Blanc Bordeaux used a clear 4-2-3-1 formation, relying on attacks from the wings, with Gourcuff running the centre of midfield. The team played good football, building possession from the back, and attacking with three creative players and Chamakh. 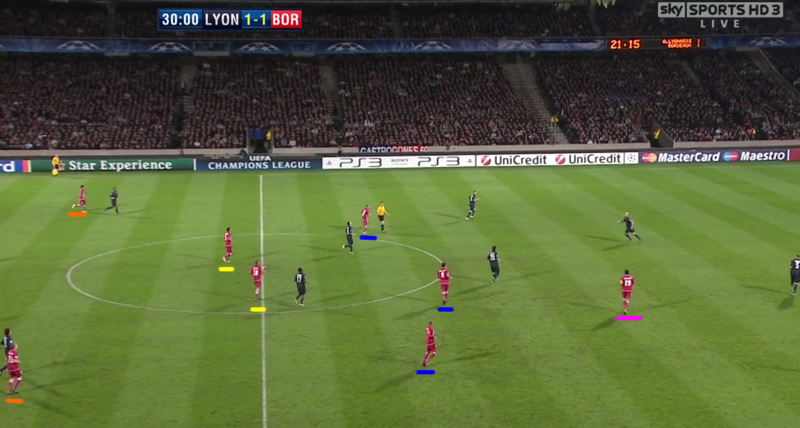 Their formation is visible in this screenshot of the Lyon vs. Bordeaux Champions League Quarter Final first leg in 2010. The fullbacks are marked orange, the holding midfield yellow, attacking midfielders in blue, and Chamakh as striker in pink. Chamakh played a crucial role for Bordeaux, leading the line and scoring goals, a constant threat to defenders. His style does not involve running with the ball or outpacing opposing defenders, but rather linking up with midfielders, and holding up the ball, in the ‘false nine’, and converting crosses in the box. Marouane Chamakh could essentially pose Arsene Wenger a selection problem this season if Arsenal stick to their current tactical set up, but ultimately he provides excellent cover for a team which has been stretched far too often over the previous few years. In 2009 – 10 Arsenal played with what was widely regarded as a 4-3-3, but in effect was a fluid 4-2-3-1 formation. This consisted of two central midfielders holding the centre of the park, whilst Fabregas played between the lines. Two wide players, usually Arshavin and Nasri, looked to cut in from the flanks, whilst a single striker played as a ‘false nine’, dropping deep. Chamakh actually has the attributes to play in 4-2-3-1, as he played the stiker’s role in this formation at Bordeaux. The team played two slightly deeper central midfielders, with attacking support from three forward midfielders. Their line-up against Bayern Munich in last season’s Champions League is a good example of Bordeaux’s system in action. 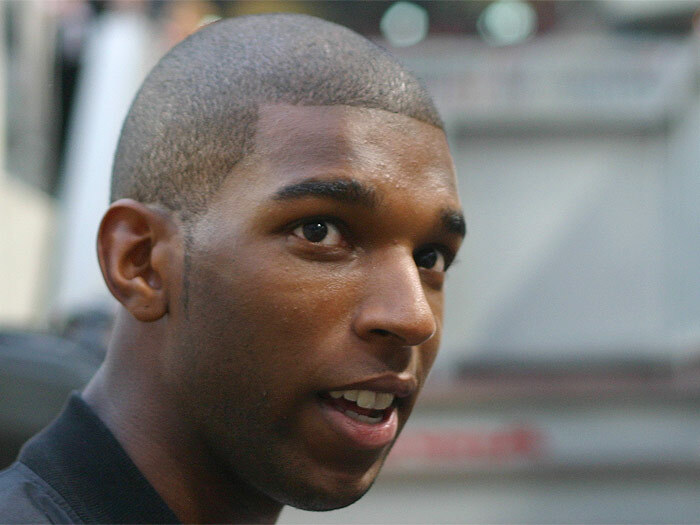 Ryan Babel was a Wenger transfer target in the summer of 2007. The press were reporting that it was a done deal, that Ryan would be joining Arsenal in a matter of weeks. However, the deal fell through, and it looked like the Ajax player would remain in Amsterdam, that was until Rafa Benitez came in with an £11.5 million bid which took Ryan to Liverpool. This suggests that he still has a place in the squad if he decides to stay. Wenger has also stated that we have not placed bids for any players, with just a week to go until the close of the transfer window. We have again been linked with Matuidi, whether there is any truth in these rumours is doubtful, but I wouldn’t be surprised if Wenger has his eye on at least one target to bring in before the week is out. In other news Lescott has finally signed for Citeh for £22m, taking their spending to over £120m this summer. That’s about a third of all the Premier League spending, which shows how heavily they are investing. That may push Everton to now place a bid for Senderos. Ex-Gunner Sol Campbell has also signed on at Notts County, seemingly lured by the long term project at the League Two club, and the presence of ex-England manager Sven Goran-Eriksson. The move surprised Wenger, as it is a step down from Premier League football, but Campbell has the chance to play for several more years, and help the club progress. In any case Arsenal look strong, but like the past two seasons, when injuries strike: we will suffer. The team needs more depth if we really want to be strong contenders for trophies. The aftermath of the first home game of the season seems to be positive. A 4-1 victory over Portsmouth highlighted the flexibility of the 4-3-3 formation, which has brought us 12 goals in 3 games so far. The goals are coming from all over the park which is good, as in the past we have suffered from a lack of goals from midfield. Our top scorers in all competitions are now Gallas – 3, Cesc – 2, and Diaby – 2. The strikers we have are proven goalscorers too, the likes of RvP and Eduardo for example. Defence also seems strong, with new signing Vermaelen looking particuarly solid in the air and on the ground on Saturday. The 4-3-3 formation looks solid, allowing midfielders to get forward, and the likes of Eduardo and Arshavin to be creative in attack. Song, Cesc, Arshavin and Wenger all discussed the new system in the Portsmouth matchday programme, and emphasized the redefined roles they will play. They also pointed out that we can switch back to a 4-4-2 when needed. I think the formation also suits our players, as we have many attack minded midfielders, and a fluid style of passing and movement. The new formation allows us to keep balance in the team, not too defensive, but not leaving the defence exposed either. On the transfer front things are still pretty quite for Arsenal, but I expect we might see one more face come in the next week or so. 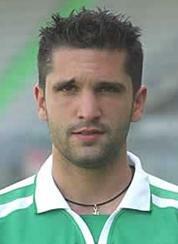 City have signed Silvinho from Barca, increasing their numbers of ex-Arsenal men. I don’t blame him for taking the opportunity, his playing days are nearing an end and he will most likely be on generous wages. Joleon Lecott is also set to sign for City today, becoming the 3rd most expensive defender on record. I wouldn’t say he was worth £20m plus, but if they have the money then why not. Thats all for today, should have more stories and a Celtic preview tomorrow. check out Untold Arsenal for a great review of Premier League club debt, makes interesting reading as always. Emotional attachment aside, if it goes ahead then the sale of Kolo Toure to Man City is a good piece of business. £16 million for a player whose best years are behind them and who struggled to perform last season (a very low rank on OPTA stats) suggests that Arsene knows what he is doing. Toure is set for a medical today at Eastlands and the deal seems likely to be finalised. It is a blow for the club in terms of experience, but judging on Wenger’s comments after the Haladas game he sees the sale as necessary. Toure wanted out in January and we have 7 central defenders already on the books. It looks like it will be Vermaelen and Gallas as our first choice, leaving Djourou, Senderos, Silvestre and possibly Song for cover. The cover isn’t top quality, and Vermaelen is new to the Premiership, but it could work out. Wenger has some money to play with now, although we may not necessarily see new faces at the club. It would be a confidence boost, for the fans and players, but Wenger seems to want to stick with the current squad. Bar a Flamini style transformation, Denilson, Song and Diaby are not quite good enough to warrant first choice in central midfield with Cesc. That in my opinion is the only area that needs strengthening in the squad. The profits from our sales leave us with up to £30 mill to spend (or £15 mill if you count Arshavin’s fee). That needs to be reinvested in at least one player. Wenger is remodelling this team to challenge for honours, but our weakness over the last two years has been a lack of strength in depth and experience. I’m fine with Wenger selling players on, we make a profit, and generally he knows the right time to sell, but these players must be replaced. Kolo’s departure may prove to be a good piece of business, but the squad still needs some additions. Fresh from signing Emmanuel Adebayor from Arsenal, Mark Hughes and Manchester City are apparently sniffing around another one of Arsene Wenger’s first-team regulars. Several reports are suggesting that they are set to step up their interest in Kolo Toure after missing out on John Terry. The defender only has one-year remaining on his contract at Arsenal and this means that an offer of around £15m could be enough to tempt Wenger to sell. Considering that he would be offered around £120,000 per week at Eastlands, it seems likely that Toure would agree to the move. In fact, you get the feeling that that Toure would jump at the chance to join Adebayor at Manchester City. Not only would he be doubling his Arsenal salary, but it would represent a new challenge for him. Toure requested to be placed on the transfer list back in January after a fall-out with team-mate William Gallas, after all. This request was rejected by the club, but it did indicate that Toure was open to the idea of leaving Arsenal. For Arsenal fans, this is a slightly worrying trend. Players seem to be considering moves away from the club far more often than they should be. The Gunners are in danger of turning into a selling club with the likes of Hleb, Flamini, Henry and Adebayor moving on in recent times. What do we think about the future of Toure though? Is he integral to Arsenal’s future or should he be allowed to talk to Manchester City if these reports turn out to be true? Personally, I think it all depends on the feelings of the player. If Toure has put aside his differences with Gallas and is keen to start the season as an Arsenal player, any Manchester City offer should be rejected without a second thought. Toure is a major part of the Arsenal first-team and Wenger could do without another player to replace. If the Ivory Coast international is unhappy at the club though, then perhaps Wenger should listen to what Manchester City have to say. Nobody wants players who are not committed to the cause. Hopefully Toure is, but after his request in January who knows what his feelings are? The final question I want to put out there is – are you worried by the players being sold by Arsenal? Big names at the Emirates are constantly linked with moves away with world-class players rarely being linked with a move to Arsenal. Is this a concern?